A panel of 15 peroxidase labeled lectins, supplemented with haematoxylin-eosin staining and PAS-reaction, were used to study modifications of carbohydrates in rat testis during postnatal morphogenesis, including prenatal day 20th, postnatal days 1st, 20th, 40th, in comparison to the adult rat testis. Tissue samples were fixed in Bouin’s fluid and embedded in paraffin. Lectin panel included Con A, PSA, GNA, NPA, PNA, VAA, PIFA, CNFA, CCRA, SBA, HPA, MPFA, WGA, SNA and LABA. It was detected that postnatal morphogenesis of rat testis is accompanied by active glycoconjugates rearrangement. In late prenatal and early postnatal development most intense lectin labeling was characteristic for fetal Leydig cells, number of which reduced significantly on the 1st postnatal day. Highest selectivity of these cells binding was documented with PSA, GNA and NPA. On postnatal day 20th was detected strong reactivity of developing spermatocytes with PSA, CNFA, HPA and WGA, and to a lesser extent– with other used lectins. This lectin binding increased on the postnatal day 40th, covering all subsets of multilayered spermatogenic epithelium in within the seminiferous tubules. Since postnatal day 40th onwards granule- and capstage pro-acrosomes, early and late acrosomes demonstrated strong reactivity with PNA, VAA, SBA, HPA, CNFA and SNA; most selective acrosomes labeling was detected with PNA and SBA. Majority of used lectins strongly reacted with glycoconjugate deposits, located in the adlumenal compartments of seminiferous tubules. Three original lectin preparartions (LABA, MPFA, PIFA) proved to be useful tools in andrology research. Cellular glycoconjugates play an important role in cell recognition and interaction, conditioning normal embryogenesis and postnatal development, including differentiation, contact inhibition of growth, immune response etc. Not less important role in the morphological and functional organization of tissues and organ systems play oligosaccharidic chains of extracellular matrix. All the above sugar determinants, collectively referred as glycome, are among the first to encompass the development of various forms of pathology [1,2]. Due to unique virtue of recognizing shape, stereochemical configuration, charge and accessibility of glycoconjugate determinants, lectins occupy an important place in modern carbohydrate histochemistry research [3-5]. The most intense remodelling of glycome is characteristic for embryonic development and early postnatal morphogenesis [2,6,7]. In a plenty of publications is well documented significant rearrangement of glycoreceptors during process of spermatogenesis [8,9]. Testicular glycoprofile of the rat, as well as its differentiation-related changes has been studied using lectin-rhodamine probes [10-12]. However in the available literature we found no data concerning the investigation of rat testis carbohydrates remodelling in postnatal morphogenesis by means of lectin-peroxidase technique. Meanwhile this information should be of importance not only for better understanding of this organ embryonic development, but also serving as a reference value while studying influence of certain pathological conditions (i.e., maternal hypo- and hyperthyroidism) on the developing testes. The aim of present investigation was to study modifications of rat testis carbohydrate determinants in normal postnatal morphogenesis having used a set of lectin-peroxidase conjugates, as well as to establish the suitability of three original lectin preparations (PIFA, MPFA, LABA) for andrology research. Male offspring of 15 female Wistar rats were sacrified on day 20th of prenatal development, and on the 1st, 20th and 40th postnatal days by cervical dislocation after chloroform inhalation. Testes were excised, fixed in Bouin’s solution 24 h at 4°C and embedded in paraffin. Testes of 3 adult rats weighting 180 g to 200 g processed under the same conditions were used for comparison. The investigation was carried out according to the ethical criteria for the use and handling of laboratory animals established by Lviv National Medical University in accordance with rules and principles of the "European Convention for the protection of vertebrate animals used for experiments and other scientific purposes" (Strasbourg, 1986), "General ethical principles on experiments with animals" of the 1st National Congress on bioethics (Kyiv, 2001) and the Law of Ukraine "On protection of animals from cruelty" of 15.12.2009. For general morphology 5 μm to 7 μm thick sections were stained with haematoxylin and eosin. The cells in the developing testes were identified according to data of Parker et al. . The stages of spermatogenesis were identified according to the criteria set up by Leblond and Clermont . Total carbohydrate content was estimated by means of PAS-reaction followed by haematoxylin counterstaining. Terminal glycosidic moieties of glycoconjugates were detected using a panel of 15 lectins (Table 1) [15-18]. All used lectins, including three original preparations (MPFA, PIFA, LABA), were purified in laboratory and conjugated to horseradish peroxidase by Professor V.Antonyuk. Lectin binding sites were visualized by diaminobenzidine (Sigma, USA). More detailed information concerning lectin histochemistry staining protocols was described elsewhere . *More precise characteristics of lectin carbohydrate specificity is presented by Antonyuk. **Purification protocol and binding specificity described Antonyuk et al. .
***Purification protocol and binding specificity described by Antonyuket al. .
****Purification protocol and binding specificity described by Antonyuket al. .
Abbreviations used: Man, mannose; Glc, glucose; GlcNAc, N-acetyl-glucosamine; Gal, galactose; GalNAc, N-acetyl-galactosamine; NeuNAc, N-acetyl-neuraminic (sialic) acid; Fuc, fucose. Table 1: Lectins used and their carbohydrate specificity. Control of specificity included: (1) omitting lectin-peroxidase incubation step from staining protocol; (2) oxidation of carbohydrate determinants prior to lectin-peroxidase application by a 60 min incubation of tissue sections in 1% solution of HJO4 (Reanal, Hungary). In both the above cases negative reactivity was detected. (3) additional step included inhibitory monosaccharides (0.1 M to 0.2 M) added to the lectin-peroxidase solution prior to lectin labeling. In this case histochemical reaction with some lectins (WGA, LABA, MPFA) was decreased, but not completely abolished due to higher affinity of these lectins to tissue carbohydrates then to the inhibitory sugars. Microscopic investigation was performed using Granum R6053 photomicroscope, equipped with Echoo-Imager 502000 camera and programme ToupView 3/7. For semiquantitative evaluation of lectin binding, two investigators performed the analysis independently, blinded to lectin type. Binding intensity was evaluated using a semiquantitative scale as follows: ++ strong, + positive, +/– faint, and – negative labeling. On the prenatal day 20th and postnatal day 1st Seminiferous Cords (SC) were filled with actively proliferating Sertoli cells, containing compact dark oval nuclei. Central location in within SC occupied large size solitary gonocytes with lightly stained euchromatinized nuclei. On this stage of development SC lack lumen, their wall consisted of basement membrane and of myoid cells layer. Size of SC on prenatal day 20th exceeded the same on postnatal day 1st; significantly larger was the amount of interstitial connective tissue; the latter was enriched with fetal Leydig cells, macrophages, mast cells, plasma cells and blood capillaries (Figures 1A and 1B). Figure 1: General morphology of rat testis on the subsequent steges of morphogenesis. ?– prenatal day 20th:seminiferous cords surrounded by wide space interstitium; B–1st, C–20th, D–40th postnatal days; ?, F–adult rat: increased size seminiferous tubules, stage XII (E) and stage VII (F) of cycle. H?,× 400. Postnatal day 20th was characteristic with the increased size of Seminiferous Tubules (ST), most of which consisted multilayered seminiferous epithelium and pronounced lumen. Spermatogenic cells demonstrated less compact arrangement within ST in comparison with earlier stages of development. Cells in the adlumenal compartment of ST with small dark nuclei were identified as leptotenic and zygotenic spermatocytes; cells with large clear nuclei located closer to lumen–as pachytenic spermatocytes, some of which exposed signs of apoptosis. Spermatogonia in the basal compartment of ST demonstrated rare mitotic figures. Interstitial connective tissue contained a small number of large angular cells with oxyphilic cytoplasm– apparently Leydig cells (Figure 1C). On the postnatal day 40th basal compartment of ST was repleted by spermatogonia; adlumenal compartment consisted elongated spermatids; in between layers of spermatogonia and spermatids lied spermatocytes (Figure 1D). Adlumenal compartments of adult rat ST, besides spermatids, housed a large number of spermatozoa and residual bodies, formed from shedded excess of spermatids cytoplasm during the process of spermiogenesis (Figure 1E). In the intersticium were located small clusters of Leydig cells (Figure 1F). On the prenatal day 20th and postnatal day 1st small deposits PASpositive material were detected in the myoid layer of SC, in the interstitial connective tissue and testicular capsule; inner cell lining of SC demonstrated complete areactivity (Figure 2A). On postnatal days 1st and 20th was observed increased reactivity of compactly packed interstitium (Figure 2B). On the postnatal day 40th reduced reactivity of interstitium was combined with weak PAS-positive reaction of cytoplasmic glycoconjugates of the spermatogenic epithelium (Figure 2C). In the adult rat testis PAS reactivity was restricted predominantly to acrosomal vesicles and spermatozoa tails; adlumenal compartments of ST were loaded with PAS-reactive cytoplasmic residues, shedded by spermatids during spermiogenesis. PAS positive was also interstitial connective tissue, enriched with Leydig cells (Figure 2D). Figure 2: Redistribution of glycoconjugates in rat testes on the subsequent stages of postnatal morphogenesis. ?– postnatal day 1st: seminiferous cords enveloped by PAS-reactive basement membranes; postnatal days 20th (B) and 40th (C); D– adult rat: innense reactivity of connective tissue interstitium, cytoplasmic glycoconjugates of spermatocytes, acrosomes and spermatidderived residual bodies. PAS-reaction, × 400. Redistribution of lectin receptor sites on the subsequent steps of rat testicular morphogenesis is presented. On the prenatal day 20th extremely high reactivity (++) with the majority of used lectins, excluding CNFA, SBA and WGA, demonstrated cytoplasmic glycoconjugates of fetal Leydig cells, multiple clusters of which richly decorated connective tissue interstitium (Figures 3A-3F). 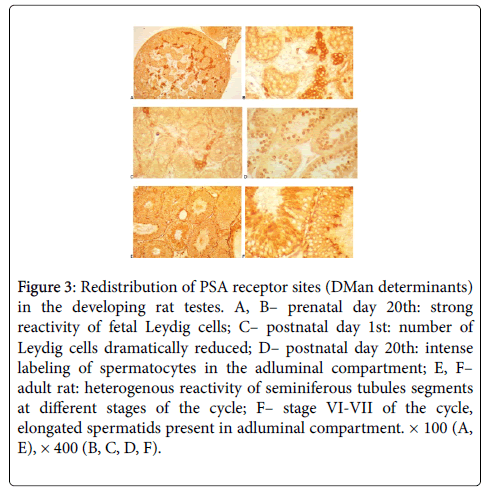 Figure 3: Redistribution of PSA receptor sites (DMan determinants) in the developing rat testes. ?, B– prenatal day 20th: strong reactivity of fetal Leydig cells; C– postnatal day 1st: number of Leydig cells dramatically reduced; D– postnatal day 20th: intense labeling of spermatocytes in the adluminal compartment; ?, F–adult rat: heterogenous reactivity of seminiferous tubules segments at different stages of the cycle; F– stage VI-VII of the cycle, elongated spermatids present in adluminal compartment. × 100 (?, E), × 400 (?, C, D, F). Best selectivity of these cells labeling was documented with mannose-specific PSA, GNA and NPA lectins. WGA marked a small number of solitary cells located within the interstitium, apparently macrophages, mast cells and plasma cells. Much weaker reactivity (+/–) exposed cytoplasmic glycoconugates of inner cellular constituents of SC, namely, Sertoli cells and gonocytes, myoid cells and basement membranes, as well as testicular capsule. On the postnatal day 1st number of Leydig cells reduced significantly; however, the left ones preserved strong (++) lectin reactivity. Lectin binding to SC constituents remained slightly positive (+/–) with the majority of lectins used (Figure 3C), while the exposure of PNA, VAA, PIFA receptor sites decreased significantly (–). In the central areas of SC, apparently occupied by apical domains of Sertoli cells and large size gonocytes, were detected deposits of PSA, CNFA, MPFA, HPA and WGA-reactive (+) glycoconjugates (Figure 3C;4A-4F; 5A-5F; 6A-6D). WGA receptors additionally decorated (+) collagen fibers and migrant leucocytes of connective tissue interstitium (Figures 7D-7F). 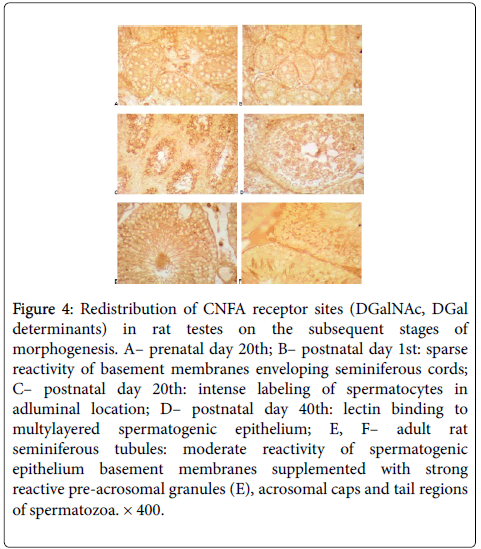 Figure 4: Redistribution of CNFA receptor sites (DGalNAc, DGal determinants) in rat testes on the subsequent stages of morphogenesis. ?– prenatal day 20th; B– postnatal day 1st: sparse reactivity of basement membranes enveloping seminiferous cords; C– postnatal day 20th: intense labeling of spermatocytes in adluminal location; D– postnatal day 40th: lectin binding to multylayered spermatogenic epithelium; ?, F–adult rat seminiferous tubules: moderate reactivity of spermatogenic epithelium basement membranes supplemented with strong reactive pre-acrosomal granules (E), acrosomal caps and tail regions of spermatozoa. × 400. Figure 5: Histotopography of MPFA receptor sites (GlcNAcβ(1-2)Manα(1-6) determinants) in the developing rat testes. A– prenatal day 20th: reactivity restricted to fetal Leydig cells and envelopes surrounding seminiferous cords; B– postnatal day 1st: number of Leydig cells decreased significantly; C– postnatal day 40th: different intensity reaction of spermatogenic epithelium; D, E, F– adult rat: heterogenous distribution of lectin label: E– stage II, stage VI: pre-acrosomal granules and elongated spermatids strong reactive. × 100 (A, B, C, D), × 400 (E, F). 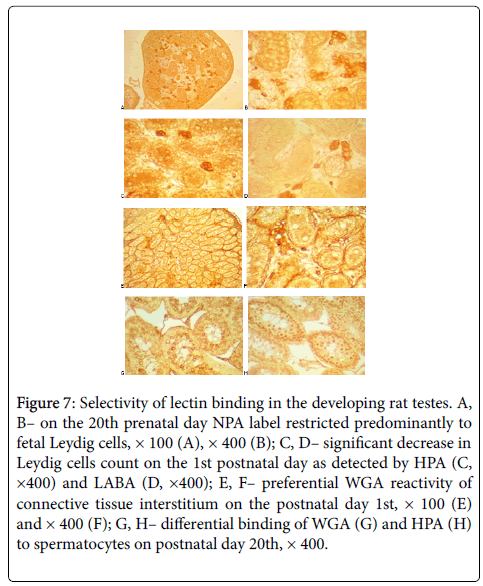 Figure 6: LABA lectin label (LFuc determinants) in the developing rat testes. A– prenatal day 20th: intense reactivity of fetal Leydig cells, moderate labeling of seminiferous cords; B– postnatal day 1st: reduced nuber of Leydig cells, less intense reaction of seminiferous cords; C– postnatal day 40th: rather heterogenous lectin binding to seminiferous epithelium; D– adult rat: Leydig cells and tail regions of spermatozoa clearly visible. × 400. Figure 7: Selectivity of lectin binding in the developing rat testes. A, B– on the 20th prenatal day NPA label restricted predominantly to fetal Leydig cells, × 100 (A), × 400 (B); C, D– significant decrease in Leydig cells count on the 1st postnatal day as detected by HPA (C, ×400) and LABA (D, ×400); E, F– preferential WGA reactivity of connective tissue interstitium on the postnatal day 1st, × 100 (E) and × 400 (F); G, H– differential binding of WGA (G) and HPA (H) to spermatocytes on postnatal day 20th, × 400. 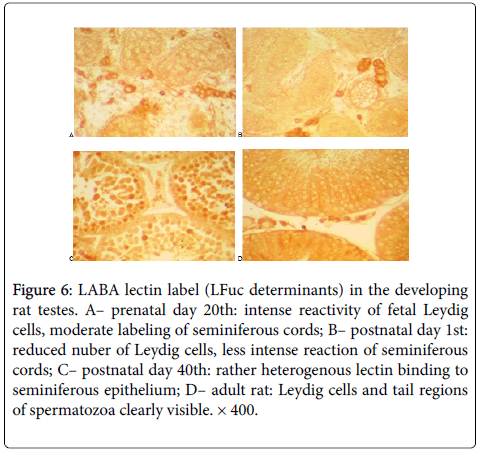 On the postnatal day 20th in within ST appeared lumina and– in the adluminal location– a layer of strong lectin-reactive (++) roundshaped spermatocytes (Figure 3D; 4C; 7A-7C, 7G, 7H). The highest selectivity of these cells labeling was achieved with PSA, CNFA, HPA and WGA, the poorest– with PNA, SBA and SNA lectins. On the postnatal day 40th cytoplasmic glycoconjugates of all subsets of multilayered spermatogenic epithelium, including spermatogonia, spermatocytes and developing spermatids demonstrated strong reactivity (++) with Con A, PSA, GNA, NPA and LABA (Figure 4D; 5C; 6C), faint binding (+/–) of PNA, VAA, PIFA and SBA, and moderate reactivity (+) with all the rest lectins used. Lectin labeling of each particular segment of ST on postnatal day 40th was rather heterogenous, strongly depending on the phase of spermatogenic cycle. Begining from postnatal day 40th onwards a wide diversity of lectins labeled (+) proacrosomal granules and caps of developing spermatids. In the adult rat testes mannose-specific lectins (Con A, PSA, GNA, NPA) labeled (+) cytoplasmic glycoconjugates of Leydig cells, different subsets of spermatogenic epithelium, tails of mature spermatozoa (Figure 3E, 3F). Binding of CNFA, similarly to MPFA, was restricted predominantly to acrosomal granules and caps, as well as to tails of spermatozoa (Figure 4E, 4F; 5D, 5E, 5F). LABA rather uniformly labeled (+) cellular constituents of ST with the enhanced Leydig cells reactivity (Figure 6D). PNA, VAA, SBA HPA and SNA strongly reacted (+) with the developing and mature acrosomes (Figure 8). It is noteworthy, that most of the lectins used, excluding PNA, VAA and SBA, strongly reacted (+) with glycoconjugate deposits, located in the adlumenal compartments of ST (Figure 3 E, 3F; 5D, 5E, 5F; 8A-8F), apparently representing residual bodies, shedded by spermatids during spermiogenesis. 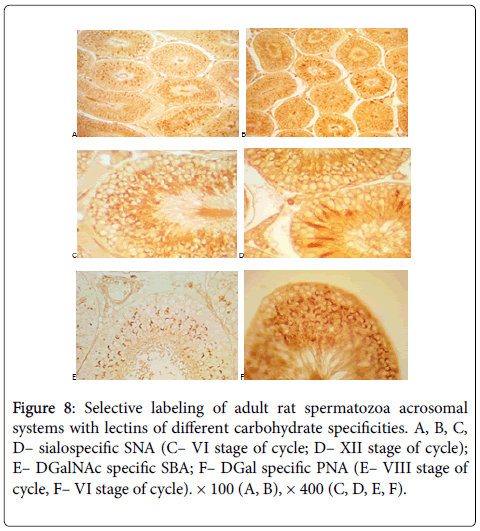 Figure 8: Selective labeling of adult rat spermatozoa acrosomal systems with lectins of different carbohydrate specificities. A, B, C, D– sialospecific SNA (C– VI stage of cycle; D– XII stage of cycle); E– DGalNAc specific SBA; F– DGal specific PNA (E– VIII stage of cycle, F– VI stage of cycle). × 100 (A, B), × 400 (C, D, E, F). Our general morphology data are consistent with results of others [11,13,20], who reported that definitive morphological and functional characteristics rat testis acquire on the 46th day of postnatal life, after the first spermiation completed. 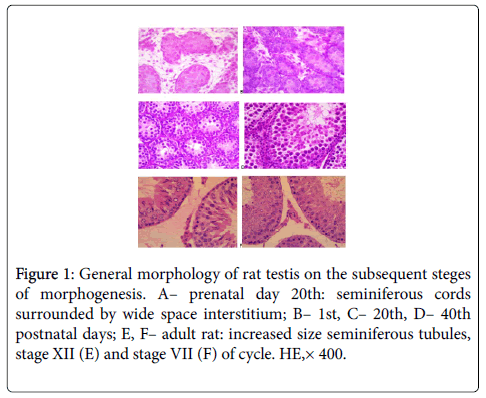 During early postnatal period of life three most important morphogenic processes take place in within the rat testis: (1) between postnatal days 10-20 alumenal seminiferous cords are transformed into seminiferous tubules with well defined lumina; (2) between 15-18 days of postnatal life testicular descent into the scrotum occurs ; at 15-20 days of age blood-testis barrier is established by Malmi et al. . Before this term, prior to stimulatory surge of pituitary gonadotropins, rat testis is treated as undifferentiated . The enhanced PAS reactivity of testicular constituents detected on postnatal day 20th in comparison to postnatal day 1st apparently is related to higher hydration mode of embryonic tissues compared to later stages of ontogeny. Less compact spermatogenic cells arrangemend inside ST on the 20th postnatal day may be resultant of a testicular descent into the scrotum taking place in days 15-18. Likewise, this same expansion of interstitial spaces after testicular descent may cause decreased PAS reactivity of histological specimens on postnatal day 40th. Lectin histochemistry investigations demonstrate that on prenatal day 20th the richest deposits and widest diversity glycoconjugates were exposed in the cytoplasm of fetal Leydig cells, which contained receptor sites for the majority of used lectins. Lack of CNFA, SBA and WGA binding apparently reflects deficiency of DGalNAc and DGlcNAc carbohydrate determinants in these cells population. Lectin reactivity of basement membranes, surrounding SC in late prenatal and early postnatal periods, according to Malmi et al. is related to their laminin content. Cellular constituents of SC on the above periods of development were significantly less reactive, but acquired intense and diverse lectin-binding patterns during subsequent phases of postnatal morphogenesis. On the 1st postnatal day we detected a significant decrease in the number of interstitial Leydig cells, while gonocytes and apical domains of Sertoli cells in the central areas of SC exposed glycoreceptors with DMan, DGalNAc and DGlcNAc termini. Similar glycan moieties of strong reactivity were characteristic for primary and secondary spermatocytes first detected on postnatal day 20th. Multilayered spermatogenic epithelium on postnatal day 40th demonstrated the accumulation of DMan and LFuc combined with reduction of DGal and DGalNAc carbohydrate determinants. Our data are in agreement with observations of others [10-12, 21], encompassing the increase in complexity and biochemical diversification of cellular glycoconjugates of both spermatogenic and Leydig cells, triggered by pituitary gonadotropin secretion after postnatal day 15 [11,22]. Acrosomes of rat spermatids and developing spermatozoa in our hands were strong PAS-reactive, exposing glycans with terminal DGal, DGalNAc and NeuNAc residues; however, the most selective labeling of this organelle was achieved with SBA– a lectin specific to DGalNAc. These data are in good correlation with results of Arya et al. [10,11], of Malmi et al. , as well as with earlier observations of others on the selective labeling of murine acrosomes with SBA [21,23], and of human acrosomes with PNA and SBA . It should be also noted, that acrosomes of spermatozoa in human ejaculate additionally exposed DGlcNAc and LFuc sugar determinants (receptor sites for WGA and LABA lectins) . Variable staining patterns during different spermiogenic steps in adult rat testis suggest continuous modification of acrosomal glycoconjugates by glycolytic enzymes and glycosyltransferases . Moreover, Arya et al. proposed to use differential lectin labeling for selective identification of subsequent steps of acrosomal maturation– i.e., pre-acrosomal granules, cap stage, early and late acrosomes. Appearance of lectin-reactive glycoconjugate deposits in within the ST of adult rat strickingly resembled distribution of lectin-like receptors for α1-acid glycoprotein in the same testicular structures , this observation apparently encompass important role of both– sugar residues and endogenous lectins– in sperm-egg interaction. Despite fine differences in carbohydrate specificities, histochemical binding of mannose-specific lectins was similar, if not identical with the same testicular constituents. Therefore, from this group only one lectin- apparently PSA, can be recommended for futher histopathological investigations on the rat testis. Likewise, from group of galactose-specific lectins PNA should be preferred. However, three original lectin preparartions – LABA, MPFA, PIFA– proved themselves to be rather unique and useful tools in carbohydrate histochemistry research. Our results are somewhat different from observations of Synenko et al. , who described Con A binding to nuclear chromatin of adult rat spermatogonia: in our hands these cells nuclei were completely reactive. Moreover, the above authors postulated, that LFuc-specific LABA lectin can discriminate in between type A (reserve) and B (activated) spermatogonia. We detected a rather uniform distribution of LABA label in different types of adult rat spermatogenic epithelium. These discrepancies may relay on different modes of fixation– Bouins fluid used in our investigation and 4% formalin used by the others. In a wide range of publications lectins are referred as sensitive tools for the detection of apoptotic cells . In particular, DMan and DGal carbohydrate determinants (recognized by PSA, GNA, NPA, RCA, VAA lectins) were recommended as a reliable markers of cells engaged in apoptosis using cytochemical methods [28-30]. In another set of publications [28,9] it was speculated that DGalNAc, DMan, DGal and LFuc determinants can serve as markers for histochemical in situ identification of apoptotic cells in seminiferous epithelium. Our recent findings on wide diversity and intense remodelling of carbohydrate determinants in ST of rat testis makes this notion questionable. Since lectin histochemistry methods are qualitative rather then quantitative, and most of the detectible carbohydrate determinants are more or less presented in distinct cell populations, their evaluation should be of less validity, then morphological criteria of apoptosis (i.e., condensation of chromatin, fragmentation of nucleus, formation of cytoplasmic blebs etc.). However, quantitative evaluation of exposure of carbohydrate determinants serving as pro-apoptotic signals (PSA, GNA, NPA, HPA, PNA, SBA, UEA I lectin receptor sites) still remains the matter of choice. Postnatal morphogenesis of rat testis is accompanied by active glycoconjugates rearrangement. In late prenatal and early postnatal development most intense lectin labeling was characteristic for fetal Leydig cells, number of which reduced significantly already in postnatal day 1st. Highest selectivity of these cells bindingt was documented with PSA, GNA and NPA lectins. On postnatal day 20th strong reactivity of developing spermatocytes with PSA, CNFA, HPA and WGA was detected. These lectins binding increased on the postnatal day 40th, covering all subsets of multilayered spermatogenic epithelium in within the seminiferous tubules, including spermatogonia, spermatocytes and spermatids. Begining from postnatal day 40th onwards granule- and cap-stage proacrosomes, early and late acrosomes demonstrated strong reactivity with PNA, VAA, SBA, HPA, CNFA and SNA; most selective acrosomal labeling was detected with PNA and SBA. These findings demonstrate rationale of lectin-acrosomal binding for the evaluation of spermatozoa fertility, in parts, as a preparatory step in extracorporal fertilization protocol. Three original lectin preparations– LABA, MPFA, PIFA– proved themselves to be useful tools in andrology research. The obtained data will be used as a reference value in further studies on the influences of certain pathological conditions– namely, of maternal hypo- and hyperthyroidism– on the developing testes. We wish to thank Dr Pharm Sci, Professor V. Antonyuk for providing lectin-peroxidase conjugates, and Professor R. Bilyy for his comments on the manuscript. Gabius HJ (2009) The sugar code: fundamentals of glycosciences. John Wiley-Blackwell, Weinheim1-156. Varki A, Cummings RD, Esko JD, Freeze HH, Stanley P, et al. (2009) Essentials of glycobiology. (2nd edn),Cold Spring Harbor Laboratory Press, Cold Spring Harbor, New York, USA. 29-178. Sharon N (2007) Lectins: Carbohydrate-specific reagents and biological recognition molecules. J Biol Chem 282: 2753-2764. Roth J (2011) Lectins for histochemical demonstration of glycans. Histochem Cell Biol 136:117-130. Dan X, Liu W, Ng TB (2015) Development and applications of lectins as biological tools in biomedical research. Med Res Rev 36: 221-247. Voloshyn NA, Grigorieva EA (2005) Animal and plant lectins: role in morphogenesis. J Acad Med Sci Ukraine11: 223-237 (in Ukrainian). Tabachniuk NV, Oliynyk IYu, Lavriv LP (2010) Lectin histochemical investigations and embryogenesis. Clin Anat OperSurg 9: 95-100 (in Ukrainian). Gallo A, Costantini M (2012) Glycobiology of reproductive processes in marine animals. Mar Drugs10: 2861-2892. Rovira VS, Frutos EB, Ferrer C, Hernandez JM, Pastor LM (2015) Identification of apoptotic cells bymeans of lectin histochemistry: A state of the art review. J Cytol Histol 6:309. Arya M, Vanha-Perttula T (1984) Distribution of lectin binding in rat testis and epididymis. Andrologia 16: 495-508. Arya M, Vanha-Perttula T (1986) Postnatal development of lectin-binding pattern in the rat testis and epididymis. ActaAnat (Basel) 127: 100-109. Malmi R, Frojdman K, Soderstrom KO (1990) Differentiation-related changes in the distribution of glycoconjugates in rattestis. Histochemistry 94: 387-395. Parker GA, Picut CA (eds) (2016)Atlas of histology of the juvenile rat. Amsterdam: Elsevier-Academic Press 227-247. Leblond CP, Clermont Y (1952) Definition of the stages of the cycle of the seminiferous epithelium in the rat. Ann NYAcad Sci 55: 548-573. Antonyuk VO (2005) The lectins and their resources. Quart, Lviv1-554 (in Ukrainian). Antonyuk R, Lutsyk A, Antonyuk V (2014) Lectin purification from fruiting bodies of brown roll-rim fungus, Paxillusinvolutus (Fr. )Fr., and its application in histochemistry. Rom J Morphol Embryol 55: 787-796. Antonyuk R, Lutsyk A, Antonyuk V (2016) Lectin purification from carp roe (Cyprinus carpio L.), investigation of itscarbohydrate specificity and application in histochemistry. Rom J Morphol Embryol 57: 985-994. Antonyuk VO, Yashchenko AM, Antonyuk RV, Ambarova NO (2009) Carbohydrate specificity of lectin, purified from the fruiting bodies of Mycena pura (Fr.) Kumm. and its use in histochemical research. Biopolym Cell 25:466-475 (in Ukrainian). Sogomonian E, Lutsyk A (2012) Structural, functional, and lectin histochemical characteristics of rat ovaries andendometrium in experimental hypo- and hyperthyroidism. Folia Histochem Cytobiol 50: 331-339. Krinke GJ (2000) The laboratory rat. Elsevier-Academic Press, Amsterdam, Netherlands. pp. 145-319. Lee MC, Damjanov I (1984) Anatomic distribution of lectin-binding sites in mouse testis and epididymis. Differentiation27: 74-81. Parvinen M (1982) Regulation of the seminiferous epithelium. Endocrine Reviews4: 404-417. Varyvoda O, Filyak Y, Lutsyk AD, Stoika RS (2012) Knockout of pttg gen in mice is associated with the enhancedexposure of DGalNAc carbohydrate determinants. Biopolymers and Cell28: 129-133 (in Ukrainian). Arenas MI, Madrid JF, Bethencourt FR, Fraile B, Paniagua R (1998) Lectin histochemistry of the human testis. Int JAndrol 21: 332-342. Stoika BR, Yashchenko AM, Fityo US, Lutsyk AD (2003) Lectin cytochemical study of sperm cells at couple infertility.Acta Medica Leopoliensia 9: 69-74 (in Ukrainian). Andersen UO, Bog-Hansen TC, Kirkeby S (1996) Appearance and cellular distribution of lectin-like receptors for α1-acidglycoprotein in the developing rat testis. J Reprod Fertil 107: 11-16. Synenko MM, Nakonechnyi JA, Smolkova OV, Yashchenko AM (2010) Fucoso- and mannosoglycans in the structuralcomponents of rat testes in experimental hypothyroidism. Morphology Herald 16: 416-419 (inUkrainian). Bilyy RO, Stoika RS (2003) Lectin cytochemical detection of apoptotic murine leukemia L1210 cells. Cytometry A56: 89-95. Heyder P, Gaipl US, Beyer TD, Voll RE, Kern PM, et al. (2003) Early detection of apoptosisby staining of acid-treated apoptotic cells with FITC-labeled lectin from Narcissus pseudonarcissus. Cytometry A 55: 86-93. Yashchenko AM, Smolkova OV, Stoika BR, Nakonechna OV, Lutsyk AD (2003) Hypothetic role of lectin receptors asmarkers of apoptosis in testicular cells under thyroid pathology. Tavrida Med Biol Herald 6: 153-155 (inUkrainian).